New Zealand Symphony Orchestra/James Judd. Recorded July 2000, Michael Fowler Centre, Wellington, New Zealand. Anyone buying this disc, liking it, and looking to complement their purchase with Symphonies 1 and 2 will probably be frustrated. Copland�s No. 1 was the Symphony for Organ and Orchestra of 1924, and his No. 2 the so-called Short Symphony which dates from 1933. Neither can be thought of as a conventional essay in symphonic form, but with the present work, which was completed in 1946, the composer adopted a much more traditional symphonic method. The work is in four movements, of which the last two play without a break. The music is conceived in Copland�s most immediately recognisable American style, though why these rather angular melodies, this very clean and open texture plus a kind of innocence and simplicity should be so typically American is another matter. It�s true that the very open and uncluttered orchestral sound which Copland conjures up does evoke the vastness of the American landscape, perhaps even more so for someone like myself who has never seen it. 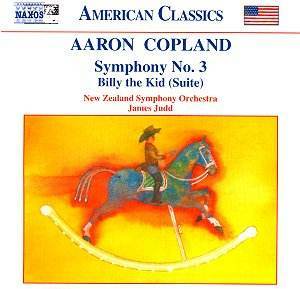 And Copland�s "�gift to be simple", so memorably put to use in his Old American Songs and elsewhere, is equally evocative, even if only in a vicarious way, of the plain and open-hearted optimism of early American settlers and their church. The first movement opens with a calm, rather large-limbed melody which is treated to much development, both here and later in the work, and which is the material for the extremely beautiful and tranquil first movement coda. The second movement is a somewhat raucous scherzo with a more peaceful trio section, and the slow movement, perhaps the most difficult from the listener�s point of view, also contains contrasting material. The finale steals in with the theme from the well-known Fanfare for a Common Man, and much of finale is based on that work. It certainly provides a grand and sonorous close, though why the composer decided to revisit the earlier work in such an extensive way in a symphonic context is unclear. The ballet Billy the Kid dates from 1938, and tells the story of the famous outlaw from the point where he begins his lawless life to avenge the murder of his mother to his own death at the hands of the sheriff Pat Garrett, and all very clearly set on the American prairie. Indeed, the opening of Billy the Kid inhabits very much the same kind of sound world as the opening of the symphony. The only real difference between the Suite, presented here, and the complete work, is a fairly significant cut towards the end. With this disc the New Zealand Symphony Orchestra makes its first appearance in my collection, but I�ll be looking out for it in future. It�s a most creditable group, with an excellent string section, though perhaps just slightly lacking in the weight some passages of this music demand. The orchestra is very well recorded in what I assume is their home, and the booklet features an informative essay by Peter Quinn. The only thing I missed in an otherwise excellent production was a detailed synopsis of the twenty-one minutes of Billy the Kid and separate tracking to help the listener know where he is. James Judd, the orchestra�s Music Director, has had ample time to assimilate the American style, as he was Music Director of the Florida Philharmonic for some fourteen years. He paces both works admirably and the required atmosphere � the score of the first movement of the symphony is marked "�with simple expression" � is well established. The one slight weakness I sensed, especially when compared to other, more authentic performances, such as Mata (EMI, Mexican conductor, American orchestra) or especially Bernstein (Sony or DG), is the slight lack of weight and power already mentioned. The finale is convincing enough but the playing lacks the steel of the finest rivals, those textures already mentioned not quite clean or open enough. Listening to Slatkin in Billy the Kid (EMI) brings similar slight doubts, but I wouldn�t want to make too much of them, because these performances are extremely convincing on their own terms, and nobody buying this disc, particularly � need one say it? � at the price, will be disappointed. I still cherish memories, however, of Copland conducting his third symphony in concert in London in the early seventies, a huge smile on his face as he encouraged the London Symphony Orchestra to an ever longer, ever louder, final crescendo.